It is the conifers, the tree and shrub skeletons, arbors, gazebos and trellises, walls and pathways that provide some kind of winter interest, even if it is in black and white right now. This is why winter is a great time to plan a new garden. It's also the perfect time to look around the neighborhood and see what looks interesting, even in winter under snow, in neighbors' gardens. Some things you can learn from your own yard, others from neighboring places, and a few by visiting a local nursery which prides itself on having an interesting garden in winter as well as spring, summer and fall. It's also a good time to notice the things in your existing garden that have gone dormant and left big blank spots. While these plants have definite uses, you don't want to rely too heavily on them if this is a garden the world will see daily as it drives by. Most gardens are bounded on at least three sides by hedges, fences or even stone walls. Sometimes, they are unattractive and will have to be hidden with a permanent planting. If the front of your house has a fairly boring concrete foundation that screams for something permanent to hide it - make a note: look into evergreen shrubs and plants (but don't plant them under the eaves - they won't get sufficient water - they should be at least 2 feet away from the wall). Other pre-existing bones are your front walk and driveway. These can be sharp diagonals or soft curves leading from the street to the front porch or garage. In most cases, this will divide the garden-to-be into unequal portions, one appreciably larger than the other(s). Usually the larger part is quite deep, which would make it impossible to access much of the garden if it were planted as one large bed. So an additional path dividing this kind of area into manageable sections is the way to go. For a front garden path, fieldstone or stone-look pavers, are practical and attractive. Try to use materials that will blend with existing masonry used in your home and garden. Back gardens can have this arrangement too, but often have a large swath taken up with a driveway or patio, or even a pool. For rear garden paths, you can use bark chips, gravel, pavers, or even shingles for a well-traveled garden path. These too are bones. Patio's may need shade during the hottest part of the day, but pools should never have trees nearby to minimize leaf-drop into the water. Children's play areas, tool sheds and other semi-permanent structures also count as bones. For winter as well as summer interest, consider Cornus alba 'Argenteo-marginata' and Variegated Red Twig Dogwood. In the winter these have bright red twigs that will show off nicely against the white bark of birch trees and of course, the snow! In summer they have leaves variegated green and white - a cooling picture on a hot day. Eventually these grow quite large, so plan ahead. Some of the tall grasses are beautifully colored and hold the snow in interesting ways for more winter interest. Put trellises against unattractive fences and sheds, and grow flowering vines on them. 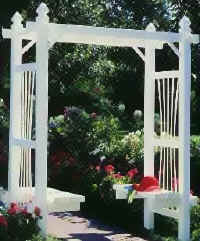 Plan arbors at the entry or off to the side of garden paths to create an elegant entrance or a resting spot. You should leave at least one nice open spot in your garden - preferably at the end of a path. This is the perfect spot for a small bench or chair in which to sit and enjoy the sun or shade and admire your garden. So there you have it - garden bones. Some of them living, some structural, but all of them things that will look good in summer and winter, give some height, depth and structure to the garden, and add visual interest even under snow.